How To Setup and Direct Blogger To Custom Domain Name? By default, the URL of a Blogger blog look like: http://yourblogname.blogspot.com. Technically, Blogger blog is a sub-domain under the main domain "blogspot.com". If you are using Blogger to host a site professionally or representing a brand, it will be better to get a domain name so that it can be accessed using an address like "www.yoursite.com". You can then redirect Blogger to the custom domain name so that it can be accessed using the domain name. The first thing that needs to be done for redirecting the Blogger blog to a custom domain is to buy a domain, of course. So get one on GoDaddy or any preferred domain registrant. You many need to configure DNS, CNAME etc. This is not covered in this tutorial. Get help from your registrant's support if required. Assuming you have the domain bought and working, let's proceed with redirecting Blogger to the custom domain name. Under "Publishing">"Blog Address", click on "+ Set up a third-party URL for your blog"
Check the redirect "domainname.com" to "www.domainname.com" - if this is not checked the blog will not open when people do not type www in front of the blog address. 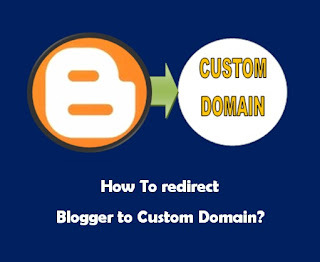 That is all that is required to redirect Blogger to the custom domain. The Blogger site can now be accessed using the domain name. I am regular reader of your blog and no doubt it all stuff is awesome. The best thing about your sharing and posting is that you always provide content that is helpful for both the newbie and experts. Looking for more stuff and tutorials.